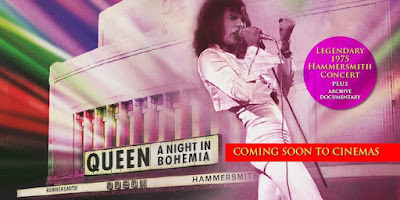 Queen’s concert film, “A Night In Bohemia”, will be screened in US theaters on March 8. "The band were in party mood at the Hammersmith Odeon that night and no wonder,” explains Old Grey Whistle Test host Bob Harris. “They had already spent the best part of a month at the top of the UK singles chart with the sensational 'Bohemian Rhapsody,' the video for which had instantly redefined the presentation of music on TV. “They were at the peak of their powers - confident and stage sharp at the end of a barnstorming UK tour. I donned top hat and tails to salute and introduce them before they played one of the best sets I had ever seen. It was an incredible night but it was more even than that. It was the moment Queen became superstars." The cinema event includes a new documentary never-before-seen outside the UK that digs deep into the archive to tell the story of Queen as it follows their journey from a struggling band gigging at pubs and colleges to the moment they broke through to larger venues and bigger crowds.